On Cambodia's Tonlé Sap Lake sits the village of Chong Khneas, but the exact position of the village changes depending on the time of year. As rains cause the lake to swell, the entire village moves to the edges of the lake, close to a nearby mountain. As the waters recede during the dry season, the village moves toward the middle of the lake. In the times in between, the village sits along the lake's flooded forest, where trees and bushes rise from the waters. 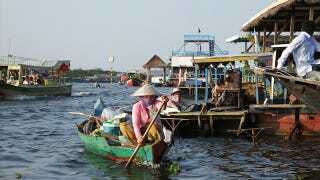 Fed by the Mekong River, Tonlé Sap Lake is the largest freshwater lake in South East Asia. As you drive closer to the lake, you'll see an increasing number of houses on stilts, so that the rising waters will leave the homes themselves undisturbed. In Chong Khneas, however, the houses actually float. The Vietnamese and Khmer households of Chong Khneas exist on small riverboats, moving the entire village when the water level gets too high or two low, and returning to the same places year after year. The vast majority of the villagers subsist on fishing and fish farming, although the boats also host a floating pig farm, two schools, a community market, a general store, a Catholic church, a Buddhist temple, and a basketball court (with netting around the sides to keep the ball from flying). The residents travel between floating buildings by long rowboats (as we entered the village, we were greeted by by the sight of two groups of children in rowboats splashing their oars at each other), and a handful of villagers make their living selling fruits and vegetables to their neighbors, rowing their wares around the village. A solar-powered cellphone tower provides phone service to what would be an otherwise unconnected population. In recent years, Chong Khneas has become a tourist destination, meaning boats filled with tourists snapping pictures have become part of their daily lives. (These photos, for example, were all taken by my mother during boat tours.) The villagers apparently don't mind these intrusions, but there are aspects of these tours that are disconcerting. The hefty fee for tours (which can be around $20 per person) goes to a private company rather than to the impoverished villagers or toward ecological preservation—not to mention the fact that you're dumping extra fuel into village waters. Plus, there are some hard sells along the way; some tourists are asked to purchase goods from the local market for the orphanage and school across the way, and some sources indicate that at least a portion of the goods are promptly returned to the market and resold. And certainly the giant restaurant barge at the edge of the village, housing a catfish and crocodile farm, is an obvious tourist trap—though the tiny crocodile farm is pretty cool. Despite these issues, tours of Chong Khneas offer a fascinating look at a group of people living an unusual modern existence. Tonlé Sap Lake also hosts the less tourist-traveled Kampong Phluk and Kampong Khleang, lakeside villages with houses on stilts, as well as the Prek Toal Bird Sanctuary. There are also organizations like UNESCO's Preservation of Cardamom Region and Tonle Sap Biosphere Reserve, looking to preserve the ecology of the region, and The Lake Clinic, which provides medical care to residents of Tonlé Sap Lake. The conservation-focused NGO OSMOSE offers ecotours of the lake, including a lake village and the bird sanctuary. Huge fishing nets are suspended from frames off the boats. This woman sells fruits and vegetables out of her rowboat. A classroom at one of the schools, which also functions as an orphanage. The lessons are in Vietnamese. The village's floating basketball court.